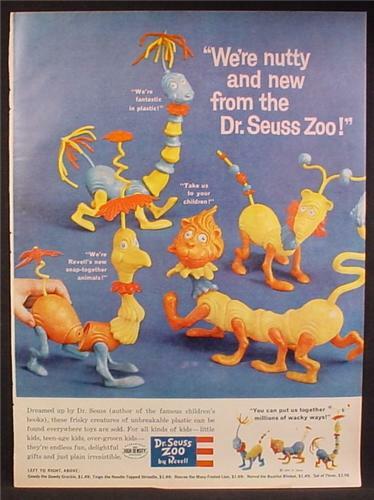 When I was 11 years old, I was crazy about these toys–the Dr. Seuss Zoo from the model company, Revell. This ad is from Life Magazine in 1959. The great thing about these was, once you owned several different models, you could mix up the parts any way you pleased and create all sorts of new critters. The parts were interchangeable from kit to kit–a great way to sell lots of kits. The downside was that the little knobs that snapped into holes had a regrettable tendency to snap off. These toys exercised your imagination–and your hands. Nowadays they’d probably be too advanced even for college students, but kids in 1959 had a lot of fun with them. Oh–you did need the ability to sit quietly in one place for a few minutes while you made what you imagined take shape. Much better for kids than zombie video games. This entry was posted on Saturday, April 14th, 2018 at 12:16 pm	and tagged with creative toys, Dr. Seuss Zoo, my childhood, nostalgia, vintage 1950s toys and posted in Just for Fun, memory lane, Pop Culture. You can follow any responses to this entry through the RSS 2.0 feed. What a great idea! Mix and match toys like this are wonderful learning tools. I never had this particular toy, but I remember having other toys which allowed me to configure and reconfigure toy trucks, or the like. What a way to learn. Great idea from the 1950’s. I was born in 1947 and can never remember being bored when growing up – even if it was just sitting against a tree eating sunflower seeds and spitting out the shells. My neighborhood gang was armed with the weapon of imagination.